For a while now, I’ve been nurturing a growing obsession with hardware: door knobs, hinges, door bells – even toilet paper holders: tangible and tarnished little objects that provide solace amidst the chaos of a hole-house restoration. (Fun fact: our house doesn’t have toilet paper holders in any of the 3 bathrooms). While it may seem absurd to spend time picking out doorknobs when the doors still need to be stripped, sanded and re-finished, I’m of the opinion that the right type of period appropriate (i.e. old and crusty) can provide a faint twinkle at the end of the tunnel of restoration madness. 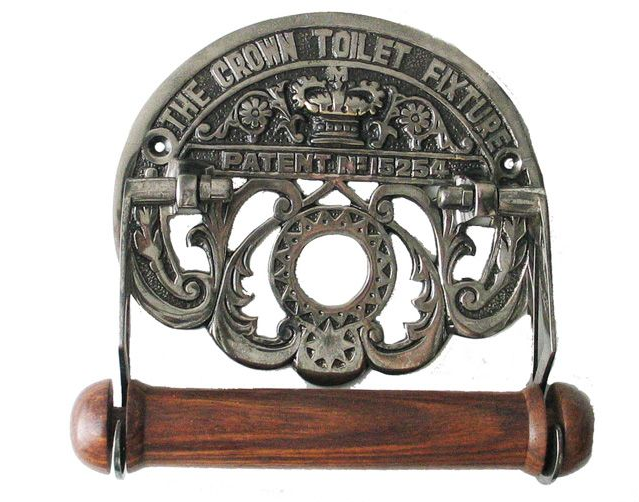 I can absolutely see this toilet paper holder in our parlor bathroom (fun fact, the parlor bathroom is currently a storage closet, and best case scenario, we are at least a year away from making it functional – but no matter: this lovely thing will hold roll upon roll of the fanciest Target brand tissue, when the time comes). The way I look at it, even the most meticulous restoration job can be ruined with the wrong hardware. It’s like wearing the wrong kind of shoes with an otherwise perfect outfit: why bother leaving the house at all (says the girl who only wears DocMartens, but you get my point). We’ve been slowly collecting bits and pieces of hardware, and I’m quite proud of the restraint I’ve shown during our last salvage excursions. A wish list is here, and so onward we go. (a few more items of inspiration for when the time comes: bathroom, kitchen and paint colors).